3 sisters get ready for adventure! Seeking adventure? You’ve come to the right place. 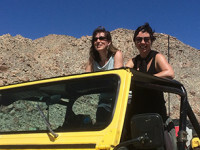 We offer desert tours of Anza-Borrego Desert State Park year round. Our excursions vary in length, itinerary, type of vehicle and activity level. To help you home in on what you’re looking for, first consider whether you want a public or private tour. Step #1: Public or Private? Ride in an open-air military truck or off-roading van with others. Follow a set itinerary (Three Terrains, Badlands, Split Mountain, Sunset to Stars, or the Celestial Overnight). Note: The tour maximum for any of the daytime excursions is 17, which is the capacity of the largest military truck, but often the number of tour participants is 6 to 10. Group minimum: We can only run public tours if we have 6 people signed up. That means your booking is contingent on others joining. However, if a public tour doesn’t meet its minimum, you can choose a private tour instead. Just you & your guide. Customize your itinerary to see & do exactly what you want. Ride together in the vehicle that best suits your needs and group size. Choose any of our public routes, or mix things up for an adventure suited just to you. Enjoy the convenience of being picked up & dropped off at your hotel (or meet at the office). Choose an open-air or climate-controlled vehicle. The Three-Terrains Tour (A Perfect Anza-Borrego Overview) features a hike in a slot canyon that is 1.25 miles round trip. Though mostly easy and level, there are sections that require stepping up and then using your arms to lift you to the next part of the canyon. Any participants who find that physical movement difficult do not need to continue further into the slot. They can wait for the group to double back. Split Mountain (A More Rugged Adventure): You must be in good physical shape to take this one-mile, uphill hike over loose rock to the Wind Caves. The way back is one mile downhill. Private tours: You can choose whether or not to incorporate hiking into your excursion. Can you handle the bouncing around of off-roading? If you have back pain or injuries, then you should consult with a doctor before signing up for an excursion. Off-roading is by nature a bouncy experience, but our drivers keep your safety and comfort foremost in mind. Note that the military trucks have been refurbished with seats designed for rider comfort, but they are military trucks after all and are not going to feel like a Lexus. The smoothest, most comfortable vehicle in the fleet is the Jeep Renegade Trailhawk, followed by the off-roading van. Both vehicles can be requested for private tours. How much time do you want to spend in the field? 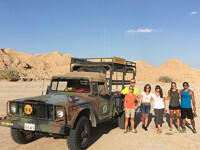 If you’re looking to take a short tour after a round of golf or before a round of cocktails at the pool, then the 2.5-hour private or Badlands Adventure is for you. The 5-hour daytime excursions (Three Terrains, Split Mountain and private ones) provide a more immersive desert experience. You’ll obviously see and do more than you would in 2.5 hours. Lunch is included. The Sunset-to-Stars Dinner Excursion is also 5 hours and provides both a daytime and nighttime desert experience. By request, we can offer private tours of various lengths, such as 3 or 8 hours. Lastly, our camping trips last about 20 to 22 hours. About once a month on a Saturday, we partner with an astronomer to provide an unforgettable camping experience. You can read more about our Celestial Overnights here. You can also reserve private camping outings by calling the office: 760-767-1232. From late spring into the fall, which is when the Milky Way is at a prime viewing position in the sky, we offer public Sunset-to-Stars Dinner Excursions. You can reserve this excursion as a private tour year round, however. Inquire by phone or email. Optimal stargazing takes place on dark nights with little or no moonlight, but by request we can provide private evening tours during any moon phase. Are you limited to specific dates? Check out our calendar to see what we’re offering on the date(s) you have in mind. 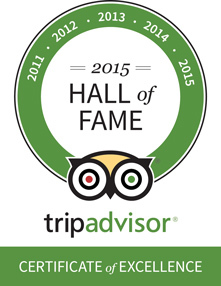 If you don’t see the tour you’re looking for, call or email us. We may be able to accommodate your request.